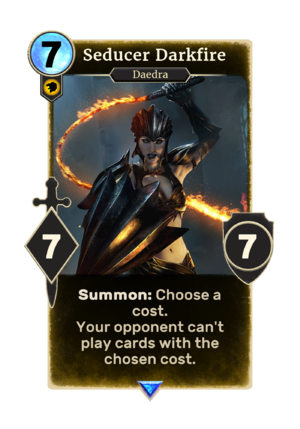 Seducer Darkfire is a rare Willpower creature card. It is part of the Isle of Madness story set. This card depicts a Dark Seducer with white skin, as they appeared in earlier instalments like Daggerfall and Battlespire. Seducer Darkfires first appeared as a type of enemy in ESO. This page was last modified on 25 March 2019, at 12:43.